Still more important, representative differences between the US and... others. It's not all about domestic appliances, though. My son actually has one of those "my first laptops!" He loves it, as corny an idea as it is. You could take this one step further. A starter swiss army knife is practical, but it does not immediately inherently have any social or societal relevance. It does not aggresively steer young minds around the biggest issues on our planet. How about an interactive globe that displayed temperature changes over the millenia or that changed colour in places in the world struck by crisis and opportunity. My first website was TERRIBLE. I think it might still be up (dedicated to the 80s) at http://www.angelfire.com/pq/philgee Terrible, frames, black background. Yuck! Rick: Oh my god... that is too good. I remember the diary, but I didn't know about this one. This was one of those coffee-out-of-the-nose moments. Arjun: I just saw "An Inconvenient Truth" last night which drives your point home quite strongly. I've never thought about what kinds of toys might help give kids a more global perspective...but even having plain globes around could help. A.R. : Excellent ; ) I wish you'd do more of these... for other countries... what would a My First [thing] be in Brazil? India? France? England? I can imagine this could be a fun exercise. Here is a "My First" from France. Oh no! It's a kitchen, same as the U.S. Wait, this must mean my first kitchens are acutally cool and therefore a fluke that they are sold here. Steve: dammit! I WANT that French My First Kitchen! You're right, way cooler. I think a fairer comparison for the U.S. would be these. Not that the stove isn't without its charm! 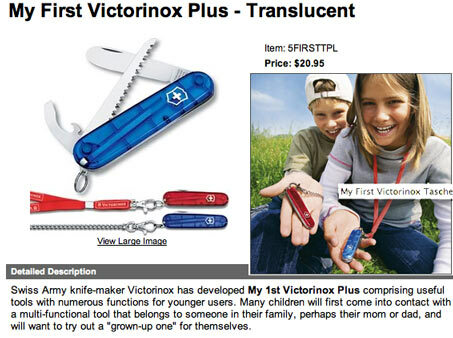 Sadly, one of the big differences is that in the U.S. if a kid cut himself or herself on their shiny new KNIFE, there's a big likelihood that Victorinox could be sued. You'll notice that all the American things would be pretty hard to hurt oneself on. As a S.F. resident I can only guess at what you had put there originally -- was it brought to you by the letters "S" and "C"? Cute post, but one that misses the point. 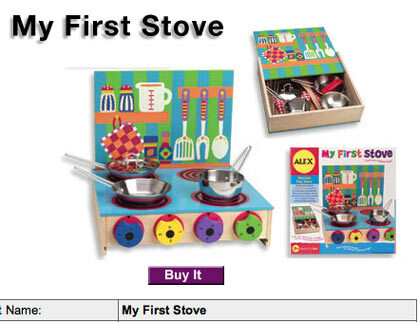 The 'My First Stove' is aimed at 3-year olds engaging in imaginative play. I don't imagine that many Swiss parents would give a knife to a 3-year old. Further, I imagine even fewer parents of any culture would encourage imaginative play with a real knife. There are other interesting things to note here, though. You never actually saw an ad for 'My First Knife'. The Victornix copy never actually describes what you're buying as a knife, though obviously that's what it is. Also, in terms of our culture, why do we feel the need to buy our children painted boxes to facilitate imaginative play which would probably occur naturally? Is it that we feel buying a painted box is somehow better than painting one ourselves. I'm guilty of this, but I can't explain it. Consumer spending on mobile networking applications -- mobile search, movie downloads and other innovative applications -- surged in the United States and overseas during the just-completed quarter, sources tell UPI's Networking. Every thing is 1st always have more importance and memories associated as compare to the second. How a Swiss knife will help to grow a child mind, what would be the thought s/he would go through would be slight different the First laptop or First pony. Although learning by making own instrument/toy would give an altogether new experience to child. Like making a paper knife by slicing a wood piece. Ooh, a friend of mine just had a baby girl, 15 days ago. I'm literally a thousand miles away and can't deliver a gift, but I'll be visiting in late August or September. 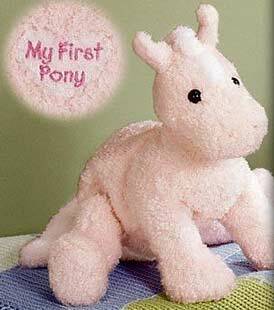 The baby is too young for any of these except the "My First Pony" thing. And she's a girl; you know: "OMG! Ponies!" :-) She won't appreciate it for it's ponyness for a few years, but it may do for a nice cuddly thing to sink her face into at play or sleepy time. I swear, I find the nicest things in the strangest places online. Not to imply your blog is strange, ha ha! I mean it was odd to find a newborn's gift idea here. Oh, and I'm a total geekhead. I broke every toy I ever had until I was five, when I learned to take them apart nicely (not break, but disassemble) and put them back together. 30 years later, I'm a gearhead to the nth degree: J2EE architect with 8 years of experience, open source contributor and user, and I can just about program anything in binary. Just get me the specs and a working sample of the actual hardware. Above I meant 30 years from when I got the Swiss Army knife, not 30 years from when I got the Altair. My first comment on a Kathy Sierra post. So, isn't it time you used your position in the community to say something useful? People listen to you. Some day soon, you're going to have to stand up and say something that will really make a difference. Will you be forever satisfied to issue good-natured requests that we accept marketing as a fact of life? Are you really content to politely call for the explicit relationship between aesthetics and functionality to be acknowledged more openly? And, oh my gosh, what on earth are we selling to the kids these days? Let's face it, the commercial value of indoctrination is generally overlooked by those of us who are too smart – and have children who, having been indoctrinated with the requisite liberal values, are also too smart – to fall for such a basic technique. As wishy-washy, free-love-and-open-source utopians who hang around blogs like this (and there are very many blogs like this), we revel in the illusion that we are the masters of our own domain. The fatuousness of the real world is far beneath us, so we gently poke fun at it to keep it at arm's length. Well, all that's gonna have to change. As educated technophiles, we like to imagine that we are changing the world for the better with our blurred boundaries, rainbow cultures, virtual communities and mild tut-tutting at each new low to which traditional politician-marketers seem prepared to stoop. But don't mistake their paucity of wit for a lack of vigour. Things have never been better for the old-school. As revenue drains away from traditional media (where thare are skilled people with imagination and integrity) and into online marketing (where there are roughly equal measures of geeks, dreamers and hucksters), we fondly imagine that we are the diligent and humane guardians of a new sensibility, when – as we speak – the same old posse of morally and intellectually bankrupt ‘values’ is poised to sweep away everything we have lovingly created. The discovery of a new frontier is always accompanied by a brief period of gentle progress, followed quickly by a wave of spirit-crushing self-interest and the relentless, grinding mediocrity of unregulated free-market economics. The internet is not an exception to this rule. It's not clever. It's not even conscious. Even now, there are clever people (people who, you could argue, constituted some sort of collective online consciousness) abandoning the blogosphere because its arteries are quickly becoming hardened by inrushing noobs with little respect for their quaint etiquette and precious neologisms. The internet is destined shortly to become exactly what it was always going to be: an enormous repository for accumulated dross, out of which we fervently hope something of value will grow. Digital compost, as somebody eminent once said. But it won't happen by itself. And it certainly won't happen if our leading lights draw the line at rolling their eyes at the antics of traditional marketers. It's time for some real action. Old-school marketing is alive and well, and set to sweep away the fragile progress made by the visionaries and the early-adopters. Do you seriously think that the money coming into online marketing will be spent in ways that you approve of? Do you really believe that our world of dialogue, sharing and holding hands can survive the influx of crude, proven non-principles that accompany the sort of opportunistic investment we're seeing today? Our best chance of changing the world was when we weren't being noticed. Now, the revolution is already as good as over – trampled beneath the overweening individualism and crass self-interest of the market. Confronted with voracious, brainless neo-con consumerism, any faith in the complexities of the medium to ensure that only clever people can play (and then, play nicely) is misplaced. As the real world lurches deeper into paranoia and fragmentation, don't be surprised to see a sort of ‘marketing fundamentalism’ come to the fore, with clear, unambiguous and authoritarian brand values once again attracting vulnerable consumers to their crude philosophical absolutes. The only rational response is a bit of well-aimed intellectual aggression. If you really believe in the redeeming power of neo-marketing, I humbly suggest that you start doing something with it. I'll be with you every step of the way. Hey, Tone. Hands off the coffee in the morning, please? My son also started with the My First Laptop and has now moved on to the Barney Laptop. But a big observation of him when he was small was his love of boxes not the toys in them.